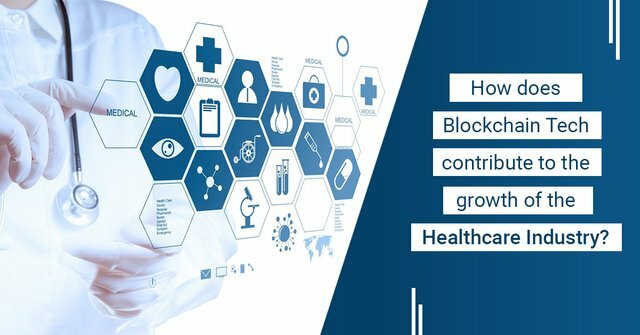 How does Blockchain Tech contribute to the growth of the Healthcare Industry? Healthcare industry around the world is suffering from many problems, such as lack of experienced and professional doctors, limited reach to proper medical information, medical tourism issues, lack of trustworthy resources, agent cost, increasing cost of medicines and related services, to name a few. While the blockchain technology may not be able to provide a solution to all these problems, it can certainly help with a number of medical industry issues. The healthcare industry is way too complex for common people like us to understand. Service providers and consumers are no longer the only two parties playing their roles in this sector. There are insurance providers, medicine companies and suppliers, agents and other third parties that also regularly contribute to the industry. While this should have made it easier for consumers to access the right medical information at the right time, it had an inverse impact on the industry. So, how can blockchain help in all this? Let’s figure out. We are also going to discuss some blockchain startups that are working in the direction of improving things for the healthcare industry with the use of the blockchain tech. Why does the healthcare industry need a change? The exchange of reliable medical or patient information is something that is still unclear and unreachable, even with so many technologies and communication means available at our disposal. But why it is so difficult to ensure a transparent exchange of medical information in real-time. This is because the present medical industry has become too institution-oriented, where every institution has a different goal and a different view on an issue than the others. This is the reason why they cannot agree on the same thing, which results in a negative impact on the services provided to the patient. For instance, the government is concerned about providing the best healthcare, while medical institutions and pharmaceutical companies are more concerned about their profits. We, therefore, need a solution that can establish an effective and transparent communication channel between all the involved parties to ensure an uninterrupted flow of information. Let’s take a look at the solution. Blockchain, by its nature, is a decentralized system that cannot be controlled or managed by a single entity. Therefore, neither hospitals nor pharma companies can single-handedly control the flow of information through a blockchain. The technology will connect all the parties, including the service providers, medical consumers and other key stakeholders to ensure a transparent and peer-to-peer flow of information. This will make it easier for medical consumers to gain access to the right information about medical service providers, hospitals and doctors and contact them at any time. This will also make it easier for healthcare institutions and doctors to access patients’ records to be able to provide the best treatment in a particular condition. Take a look at the Medipedia system, which is a blockchain-powered healthcare platform that provides decentralized access to medical data, records and information of patients and institutes. The platform is completely online and lets users search and find the right medical service for any disease or condition. In addition, it also lets patients connect with service providers, consult with them, share medical records for better consultation and set up appointments for further treatment. The Medipedia token (MEP) makes it possible to pay for transactions and services within the platform. Medipedia is just one of the several blockchain startups working on improving the conditions of healthcare services around us. You can find more information on the Medipedia whitepaper about the project and the industry.